Tool Time Tuesdays started out with tools and gadgets that I would find another use for. Seems I've gone from the hardware store to the grocery store...more like the recycling bin. 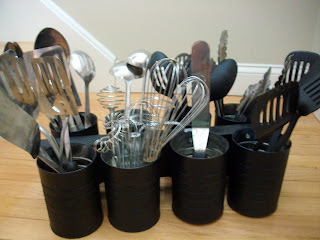 This project uses up all the metal cans in your garbage. You can uses big coffee cans, veggie cans or cans from crushed tomatoes...anything will work. Most cans now seem to have a smooth edge after you open them, but just check for sharp spots before you start. 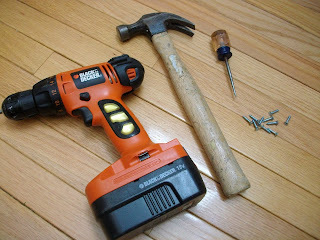 Just a few tools for this project: Drill (or screw driver), hammer, awl and metal screws. The screws have a point on the tip and mine are about 3/4" long. Now that I'm looking at this next picture after it was posted, it sure does look weird. You're probably saying what the heck is she doing with this combo of chains and leather belts. They are actually the choice of handles you can choose. If you pick the store bought handle, pictured on the bottom left, make sure it is not a cabinet handle. It has to be a handle that can be screwed in from the top, not from the back like the ones on a kitchen cabinet...see the little holes on the ends. This tutorial is more of a description rather than exact measurements for things. You will pick the can size and how many cans you will need for your carrier. You can just uses 4 cans, 2 on each side. 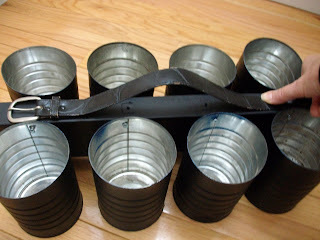 I actually made my can carrier 15 years ago for my husband. He used it first for all his desk supplies in his office. There was very little drawer space in his desk, so he needed to keep it all on a shelf. He has also used it for tools. It was first painted navy blue, but I spray painted it all black for this project. 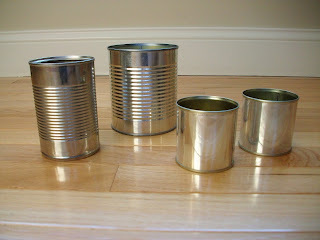 So for this project, you will need a piece of wood to attach the cans to. I picked a 2"x4" piece of wood that is long enough for 4 coffee cans on each side of the board. You can make your carrier any size. 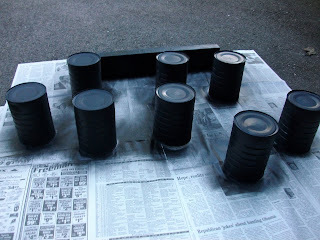 Spray your cans and the wood to your desired color. Take the point of the awl and your hammer and tap a hole at the same spot on all the cans, probably 1/4" - 1/2" down from the top. It's best to do the hammering on a scrap piece of wood or outside on the driveway. In this picture, it looks like I was doing it on the wood floor!! 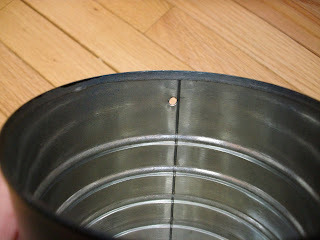 Here is a close up of the hole. 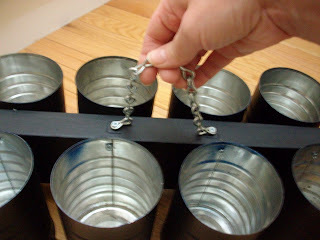 Evenly space your number of cans on the piece of wood and screw into place. 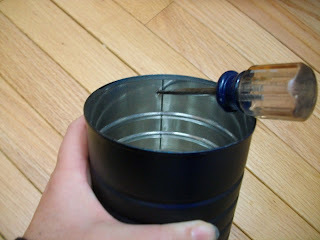 Because of the size in the can, you might have to drill the screws in on an angle. Here are all 8 of my cans screwed into the wood block. Now for the handles. Remember, I made this one 15 years ago, so I am using the same screw holes just as an example for the handles. This one is a piece of chain. If I were to use chain, I would spread it out a little wider, I just didn't want to make new holes. 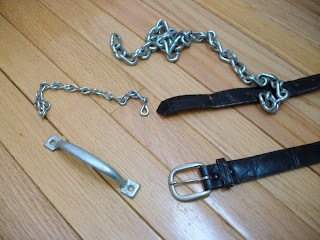 This handle example is an old black leather belt. 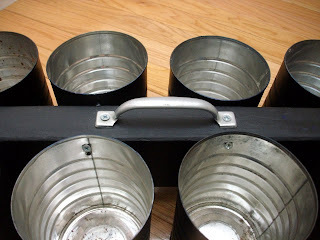 Really cute with the black cans and the galvanized look of the buckle. You would just cut the belt to desired length and screw right through the leather. Here is my original handle which I am sticking with. You can also use it as a decorative item. 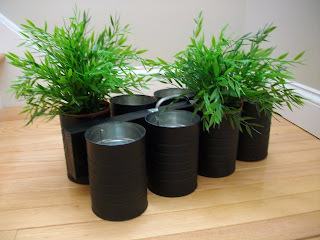 Fill with plants for a center piece for a rustic look. Aren't these plants cute? They are from Ikea for $3.00. Really cute when it's all filled up!! You can also use fresh cut flowers or an herb garden. Thanks for always stopping by and leaving such nice comments. 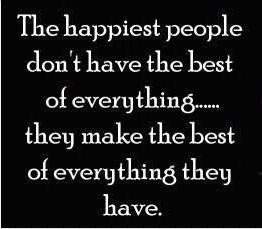 I so appreciate each and everyone. What a great idea this is! So many uses -- think I'll show this one to DH! As always, your ideas are AWESOME!!!! How do you do it?! I love how your brain works!!!! Thank you for your inspiration sweetie! Just wanted to let you know, that I am always looking forward to your shared ideas. They are so cute and useful. Thanks a lot for all your sharing! Very nice tutorial! Looks cool in black. 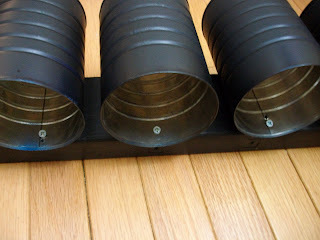 Great idea...think I will let hubby do this as a cool-weather project! What a great 'Green' recycling project! You are so clever. What a great idea!! I love and look forward to your posts. So cute, Karen! I can see a bunch of these at Christmas for the Grandkids and all of their "stuff". Thanks again for a great TTT. Another awesome tool for us! Thanks for sharing. You are so creative Karen! Another great idea! Your just too clever!! (side note...no daughters here) I laughed at that one! You took the words right out of my mouth as I was reading your blog!!! LOLOLOL. I was thinking "What the Heck is she doing"..... And the next words I read were just that!! I sat here laughing for a couple of minutes!! OMG! The only thing you didn't do was make more holes for candles! I absolutely love this one and it's a definite maker! Too funny though...you do go off a bit when you get these ideas in your head....I am really grinning over this one! 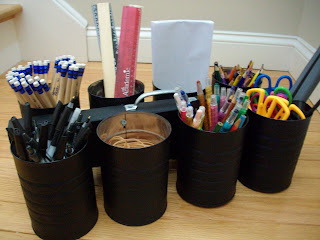 Very creative and I especially like the recycled belt handle idea. Totally cool project! This is great! 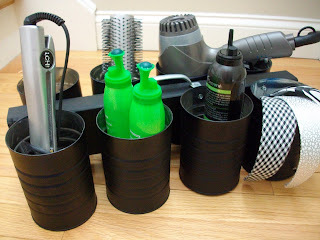 And you could cover the cans with fabric too! I like it! Neat! I like this one! One word to describe you...awesome! You're ideas are so inspiring! Wow! Love reading your posts! The best part of reading here is the generation of new ideas! 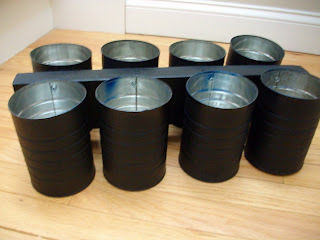 I looked at the can carrier, and thought of putting a few (2-3) holes around the bottoms, inserting a coffee filter, filling 2/3 full of potting soil, and planting a portable herb garden! I may have to make one, as soon as I figure out a spot to set it down where the cats wouldn't get to it!